Greetings all. I hope this post finds you well. I haven’t posted about a concert since my last one, Jeff Lorber Fusion at The Rams Head Tavern in Annapolis in March 2011. It’s been a minute since I’ve seen Incognito live. As a matter of fact, it was 10 years ago (I think) during the No Time Like The Future Tour at this same venue. I purchased my ticket in Dec 2011 and good seats were already going fast so I’m very glad I got seats five rows back from the stage. The crowd, always mature, is filling the theater and the time is 8:02pm. The Robert Glasper Experiment is the opening act, whose current CD. “Black Radio” is blowin’ up the jazz and R&B charts. The Robert Glasper Experiment, for this event, is Robert Glasper, keys; Mark McCollough, drums; Derek Hosge, bass; and Casey Benjamin. vocoder and sax. There’s an excellent cover story article on The Robert Glasper Trio in the April 2012 edition of Downbeat Magazine. Being a musician I’m surveying the stage equiopment…baby grand, Motif 8, and the guitarist’s dream amp, the legendary Roland JC-120, some of which may be for Incognito’s use. Robert played both the grand piano and Motif 8, utilizing its stellar Fender Rhodes patch. They did an excellent set from their latest CD. Every member of the group is EXTREMELY talented. Mark McCoilough substituted for Chris Dave, the drummer on the CD (some of you may remember him from Mint Condition). Derrick played a chorded and quite elegant, but soulful bass solo of the Stevie Wonder tune “Overjoyed” (I believe). Robert’s engaging of the crowd went over very well, as evidenced from the feedback from the ladies. They closed the set with their sonically awesome version of Nirvana’s “Smells Like Teen Spirit” I am now an official Robert Glasper Experiment fan. I regret not going up during the intermission to get that RGE CD purchased and signed, but I stayed put and watched the stage crew get it ready for Incognito. I was five rows back front and center, as a result of purchasing these tickets four months in advance. 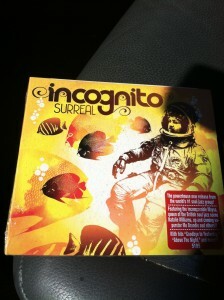 The interesting thing is I just happened to go on Incognito’s website one night and saw announcements about the tour. They’ve been to the Capitol Jazz Fest since I last saw them in 2002, but as popular as the CJF is, I’m not really a fan of seeing music on the lawn or picnic area because I prefer the comfort of a theater type setting (you know I view the performance from more than an entertainment aspect :-)) Deborah Bond, DC area vocalist (and a very good one at that) was the emcee for the event. She really engaged well with the audience and I would encourage you to check out not just her latest CD but the ones prior. The stage crew continued getting things ready for the main act. 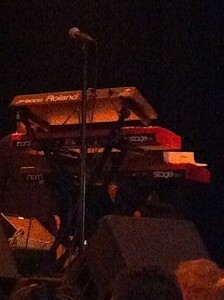 I spied Matt Cooper’s keyboard rig, two red Nord Stages and a Roland JP 8000. I noted Bluey’s guitar rig included what looked like a white Strat (just iile mine…ha) and I knew he’d would be playing his Atelier Z (a version of Fender’s famous Telecaster) which he says is… ““Simply the best guitar I have ever played!” . I can’t speak to the drum and percussion gear, nor the horns that the excellent brass section used, but it was very nice to see that Francis Hylton held down the bass duties, using that classic blue Fender Jazz 5 string bass he’s often seen with. ‘Cog played The Ram’s Head Tavern, in Annapolis MD, the night before. The Ram’s Head is an intimate jazz club that serves dinner and is obviously a much smaller venue. The audience, for all intents and purposes, is up close to the artist, but the sound system is excellent from ever seat in the house. Seeing many concerts at The Warner in the past assured me that the sound would be on point for tonight’s concert. As the stage crew appeared to be thinning and people started to return to their seats, Deborah Bond assumed her emcee duties and the excitement began to mount. Every track above was on fire, even in the smoothest sense. 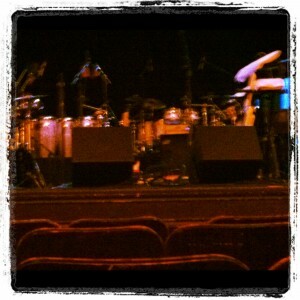 Two of the highlights of the concert was a percussion and drum breakdown which brought the crowd to it’s feet. The other was one of Bluey’s famous stories on how he got into music at the early age of five, knowing then he wanted to form a band and tour the world…a dream he is constantly living. 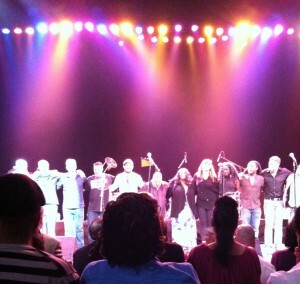 Cog closed the concert with one of their flagship songs, Deep Waters featuring the diva Maysa. She paid tribute to Whitney Houston by inserting a very nice rendition of “I Will Always Love You”, intricately woven into Deep Waters….excellent. After introducing the band, with members ranging from Ireland to Trinidad to Swaziland to Jamaica to England to Brazil, I’ve dubbed Incognito as “The International Groove Alliance”. Bluey always articulates and leaves the audience with messages of pure positivity, global positivity that is much needed in this day and age. This concert was well worth the wait.